Inishmore represents the largest of the Aran Islands and has a strong commitment to maintaining the Irish language, culture, and ancient attractions. Kick off your visit on the 5th (Sat): tour the pleasant surroundings at The Worm Hole (Poll na bPeist) and then look for gifts at Aran Sweater Market. 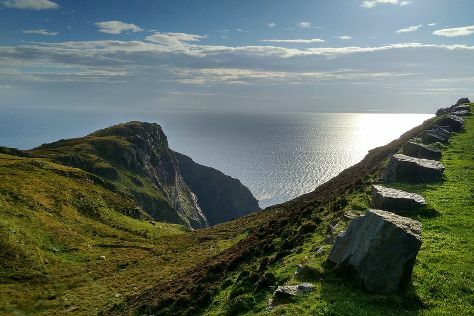 Get ready for a full day of sightseeing on the 6th (Sun): delve into the distant past at Dun Duchathair, then contemplate the long history of Dun Aonghasa, then appreciate the extensive heritage of Na Seacht Teampaill (The Seven Churches), and finally tour the pleasant surroundings at Kilmurvey Beach. To see where to stay, ratings, other places to visit, and other tourist information, read our Inishmore tour itinerary builder app . Galway to Inishmore is an approximately 2-hour combination of taxi and ferry. You can also do a combination of bus and ferry. In May, daily temperatures in Inishmore can reach 18°C, while at night they dip to 9°C. Finish your sightseeing early on the 7th (Mon) so you can travel to Galway. Kick off your visit on the 7th (Mon): take a memorable drive along Wild Atlantic Way Day Tours, tour the pleasant surroundings at Eyre Square, then appreciate the extensive heritage of Salthill Promenade, and finally make a trip to Quay Street. To see reviews, traveler tips, ratings, and tourist information, read our Galway online road trip planner . You can do a combination of ferry and taxi from Inishmore to Galway in 2 hours. Another option is to do a combination of ferry and bus. In May in Galway, expect temperatures between 16°C during the day and 7°C at night. Cap off your sightseeing on the 7th (Mon) early enough to travel back home.